Wi-Fi access and parking are free for our guests staying at Oakdale Motel where pets are also welcome. The single-story 25-room hotel has Wi-Fi throughout so you can surf to your heart's content. Snacking is made simple too with a mini-fridge and microwave in every room. Free coffee is available in the lobby. Stay in shape too with free passes to a local fitness center. There's a convenient guest laundry and on-site parking is free. Pets are allowed. 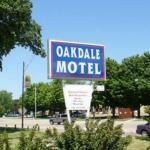 The Oakdale Motel is a five-minute drive from I-35 and walking distance from Steele County Fairgrounds. There are several restaurants on the same block as the hotel and the Preferred Outlets at Medford are just six miles away. Cabela's Outfitters is 10 minutes away and serious shoppers may want to visit Mall of America a 45-minute drive. It's 62 miles to Minneapolis-St. Paul International Airport.